In 2013 I did not watch TV, go to movies or read the news. This is my report on a year without the things my mind loved. In 2013 my mind was on a diet. In late 2012 I started to think about the idea of going on a mind-diet. I felt my mind was consuming more that it needed too. In my blog Feeding the Mind (on this site of my friend James) I shared with you why I wanted to have this experiment with myself. I wanted to see what would happen to the structure and dynamics of my mind if it went cold turkey for a year. So the journey began. 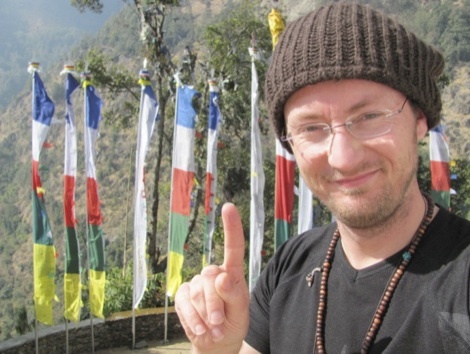 On January 1st 2013 I had the luck to be in the miraculous mountains of Nepal. I loved the mountains and the Himalayas in particular. It was winter, sunny, and I was residing for a week in the Milarepa Cave Monastery near Tibet, one of the smallest monasteries in Nepal. Milarepa, a Tibetan holy man (always depicted in blue), had meditated and lived in this cave for one to three years. They had built a small monastery around it and there was only one monk in the monastery. He didn´t speak much English and I didn´t speak much Nepali, so the two of us had plenty of time to meditate and share meals. The mountains around us were 4000 – 6000 meters high and stillness was tangible. 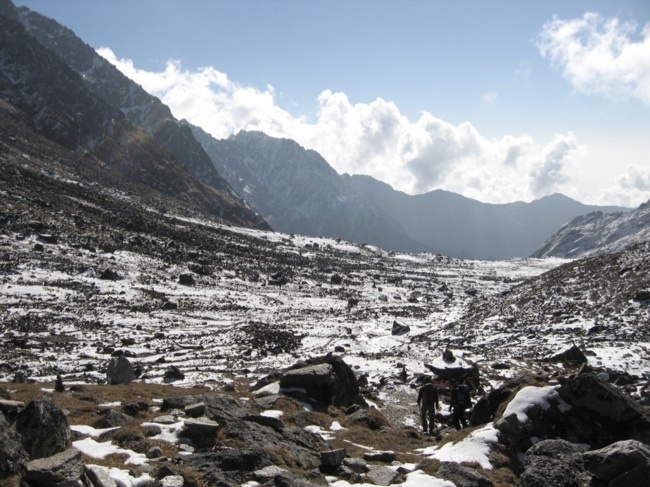 I had read about the stillness of the Himalayas but being there in “it” was different. This was my second visit to the monastery and it was a good place to slow down, explore my own stillness, reflect on 2012 and find my intentions for 2013. This cave in the mountains was the perfect place to start my minddiet. At the beginning my family got a bit nervous. They feared I might become a recluse and would not be able to connect with the world as a sane human being. After reassuring them that I did not plan to go bananas but that this was a scientific experiment they gave up most of their resistance. My mother eventually gave me a big bag of persistence and a small bag with exceptions (thanks mum!). The diet had three parts. Part 1 was abstaining from “entertainment”. This meant no TV, no movies, no DVDs and no cinema. These were things I actually really liked for most of my life. It turned out this was no problem to give up and my mind had no effects of withdrawal. Part 2 was abstaining from “the news”. I did not read newspapers, did not listen to the radio and did not watch the 20:00 o’clock news. I had not much idea of what was going on in the world besides what I heard from friends or learned at work. After discussing this with friends we learned that the news is really a rehearsal of the seven christian sins. Look at the news today and check it out for yourself; wrath (rage), greed, sloth (laziness), pride, lust, envy, and gluttony (over-consumption). Every day the news would remind you of new variations of these ‘uplifting’ aspects of mankind. During 2012 I already started to notice how reading the news didn’t help my mind to generate more hope, faith and love. So abstaining from the news for 1 year was actually quite refreshing. In looking back at 2013 the only thing that I did feel I “missed” was the story of Edward Snowden. I did search the web three weeks ago and was amazed by the extent to which the intelligence agencies gather information. Pretty creepy idea that all our sense of privacy is such an illusion. Every telephone call you make and every mail you write can be watched by the NSA or other shady organisations. Creepy hey? I also learned that alternative news sites (such as http://www.whatreallyhappened.com) get fresh viewpoints and different angles at a topic. Not that these sites don’t portray the seven sins but they are able to speak out more freely than traditional sites like CNN. My mother is a wise woman, she knows me and she suggested I would be able to make exceptions for my diet. So after 5 months of diet I did treat myself in the summer to an exception. And what important TV-food did I serve my mind? You guessed it; one semi-final and the final of the Champions League for soccer. Beautiful goal of Arjen Robben I would say. And as a Bruce Springsteen fan I also saw the impressive and uplifting documentary “Springsteen & I” in cinema (twice). What can I say? As a psychologist I also was invited to appear on national Dutch television for a live show on cancer and how to cope with this disease. After the show I did want to see if looked as a donkey to the 300,000 people who watched it. So on the internet I saw the re-run and learned that the donkey-ness was ok. Phew! So what is the state of my mind after one year without entertainment and news? It’s hard to tell but I do find some aspects appeared to have changed. In 2013 I went to bed more early and felt more refreshed after I slept. I also felt my mind was more clear and less clouded with stuff. There were less things that “sucked me in” so to speak. Many things seemed less important and there seemed to be more stillness within. This was pleasant since the silent Himalayas are not exactly around the corner of my house. I also had more free time and time to telephone with friends and read some good books (“No Logo” from journalist-activist Naomi Klein was my favourite book together with the funny stories of saxophonist Clarence Clemons in “Big Man”). So what was the most difficult part of this journey in minddiet you might ask? Well, here is the 3rd part. I did not only want to abstain from the seemingly important stories of entertainment and the news. I also wanted to abstain from the stories in my mind I kept telling myself. My mind gave great re-runs of almost everything it experienced, especially the experiences that brought me out of my comfort zone. If I felt insulted by someone, if I felt angry, if I felt not seen, if I felt bored and if I felt as a failure. Things that upset me were perfect stories for my mind. My mind loved it and re-chewed it again and again. This was the most difficult to abstain from. The TV I could switch off but not my own mind. If something was a little uncomfortable my mind would spin great stories of the event. No stillness at all. These stories could start as mere interpretations and then move towards projections or fantasies that got bigger and bigger the longer I thought about them. Funny to see that everything can become an obsession if you have too much free time to think. Bruce Springsteen has a song called “57 channels but nothin’ on”. Same for my mind most of the time. Often just exaggerated re-runs or loose cannon predictions of things to come. As a teacher and practitioner of mindfulness meditation I was glad to have some healthy suggestions of how to work with this crazy mind. I don’t think I am as crazy as entertainer Ruby Wax but she did write a sincere and funny book on mindfulness called “Sane New World – taming the mind”. Mindfulness based interventions such as Mindfulness-Based Stress Reduction (MBSR) or Mindfulness Based Cognitive Therapy (MBCT) give clear instructions in a 8 week course how to tame our mind. This “taming” is not so easy. Even after 10 years of practice I am still impressed how fast my mind can turn a peaceful state into a rage by the stories it keeps feeding itself. The great thing about mindfulness is that I don’t have to “do” anything. The challenge is simply to watch these stories and not energize them or suppress them. In some sense it’s about seeing the horror movie Nightmare on Elm Street for the 27th time. After a while you start to see some patterns and you know when Freddy is going to frighten you. Seeing it 27 times you might also realise this is not “real”, just re-runs. One research paper I heard of found out that everyday we only have 1 or 2 original thoughts. These are thoughts that we have not thought before. The rest, the researchers claim, are just re-runs. Jon Kabat-Zinn is the founder of MBSR and he included a meditation called “mountain meditation”. This practice is not so much a visualisation but more a remembering. In the practice we remember that in essence we share characteristics with a mountain. For instance; in Winter and Summer the landscape of the mountain appears different in each season, but inside the mountain is still the same. It does not get angry for the cold snow and it does not rejoice for the hot sun. As practitioners we can also can learn to be ourselves regardless of our outer circumstances. We can rest in ourselves so to speak. Not to be indifferent but to be deeply grounded and rooted in ourselves. With an old buddhist term this is called “equanimity”. Kabat-Zinn also writes about a second characteristic we share with mountains. Anyone who has been in a mountain-area, especially if you get higher up, will experience a sense of stillness. You might hear the wind or distant sounds of goats but underneath is this sense of stillness. We too, Kabat-Zinn argues, have this place inside ourselves where we feel still, peaceful and silent. In this place the chatter of the mind only feels like a far echo from the valley. To me the Himalayas in Nepal remind me of that. To be still in a world of sounds.